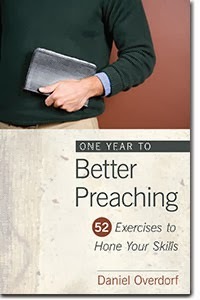 Daniel Overdorf's new book, One Year to Better Preaching: 52 Exercises to Hone Your Skills, looks to be a helpful resource whether one is a seasoned preacher who needs a refresher or a neophyte preacher looking to start off on the right foot. As the title suggests, Better Preaching is set up to provide one aspect of preaching per week to work on. I have only read the first three chapters but each exercise seems to focus on something worth working on. The chapters are long enough to explain the exercise but short enough for one to get started pretty quickly. Check out a free PDF of the first exercise here. Thanks to the folks at Kregel for sending the free copy used in this evaluation. The Preacher and the Text or a Textual Preacher?